Our mission is to revolutionise the way wealth management is delivered in the UK and our personal client sites are a key part of what makes us unique. As part of our vision to use technology to put Clients First, our exclusive client sites are available to our clients through our financial advisory services. 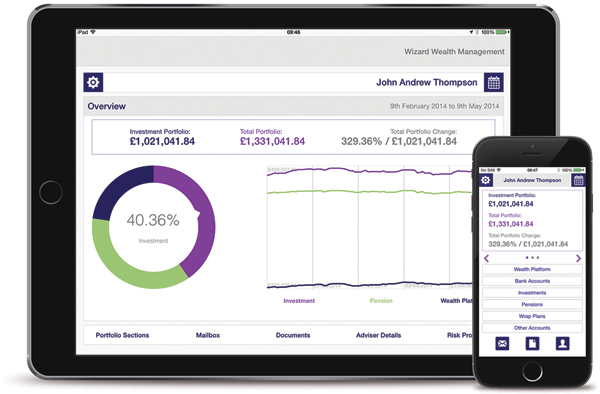 Your personal client site gives you an unrivalled insight into your personal finances, your investment goals and how your investments are performing. Our client sites solve both of these issues. You can organise and track your investments conveniently online, and get in touch with me in an instant. We believe in empowering you to take control of your investments, so we’ve made accessing your client site as simple and straightforward as possible. You can access your client site online at any time. Our responsive design means your site works on any size screen you like to use, from your home computer to a Smart TV.